London has reduced traffic deaths nearly 50 percent in the last decade, but Mayor Sadiq Khan isn’t satisfied. On Tuesday, Khan announced the release of a plan to reduce traffic fatalities and serious injuries 70 percent by 2030, and to eliminate deaths entirely by 2041 [PDF]. London’s commitment to traffic safety is notable because traffic fatalities are already much rarer there than in any large American city. For many years, the city has intentionally reduced car traffic, added pedestrian zones, and carved out street space for buses and bicycling. One result has been an impressive 59 percent drop in fatalities and serious injuries since 2000. For cities struggling to make any tangible progress on Vision Zero, London offers a better example than anywhere else in America. Even New York, where traffic deaths are falling, has nearly twice the per capita traffic fatality rate as London. While Khan’s plan includes several initiatives that were already underway, the scope of it remains impressive and worth attention. Here’s a look at the major initiatives. Transport for London has systematically identified and redesigned 21 of the city’s 73 most dangerous intersections so far. Khan’s plan calls for spending £54 million over the next four years to fix the intersections that are causing the biggest hazards, with 33 more either completed or in progress by 2023. London is investing significant resources in street projects that make walking, biking, and transit more appealing, with an explicit objective to reduce “the dominance of motorized traffic” in the city. In addition to bus lanes and bike lanes, the treatments include benches, street trees, and public art. By 2041, the goal is to eliminate three million car trips per day, or a reduction of 10-15 percent. Large vehicles are involved in a disproportionate share of traffic deaths, especially pedestrian and cyclist fatalities. 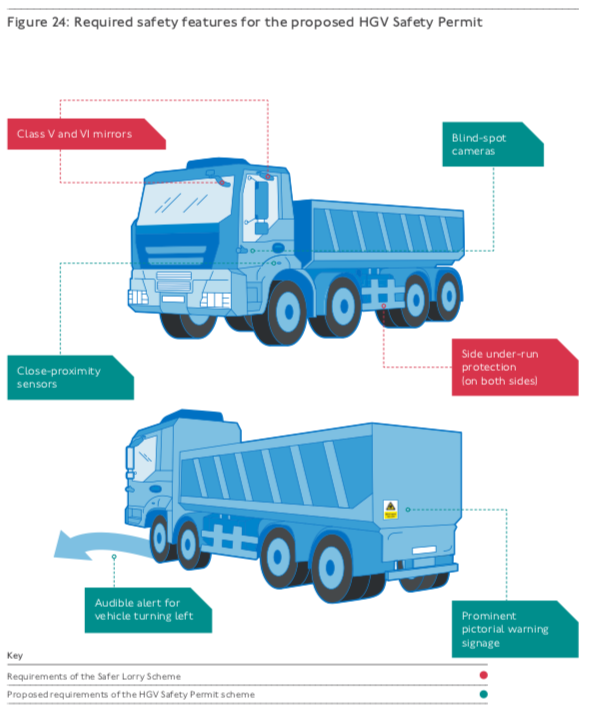 Though heavy trucks account for less than 5 percent of vehicle miles in London, they account for 50 percent of cyclist fatalities. London is very serious about imposing better design standards for vehicles that can cause the most harm. The city is working with manufacturers to redesign its buses with speed-limiting technology and more forgiving front ends, with an eye toward ending fatal bus collisions by 2030. In addition, London is cracking down on commercial trucks that have big blind spots and other safety hazards. The city has developed a five-star rating system for commercial trucks. In 2019, the commercial trucks with the worst rating will no longer be allowed on London streets. London is taking a thoughtful approach to enforcement. The city’s strategy calls for targeting the drivers who cause the most harm, including those who repeatedly drink and drive or text and drive. Police response to crashes will be much more comprehensive than in the U.S. London’s police department houses a “Serious Collision Investigation Unit” that will not only investigate the most severe cases of reckless driving, but also identify the factors causing a wide range of collisions to help the city prevent crashes. These are all fine and good if you’re locked in a planner-y social environment that sees well-lubricated urbanism as the most essential facet to living in a city with escalating crime and homeless concerns. But are these really the Quality of Life issues that Londoners identify as their top priority? Does responsive policing to target those “who repeatedly drink and drive or text and drive” will result in a more lenient approach for first-time drink drivers? Those factors get a lot of attention. But that’s just an easy way for people to absolve themselves of guilt. The biggest danger is speed and pretty much everyone speeds. That means when the eventual crash happens, it is far more likely to be fatal or cause serious injury. A pedestrian hit at 20mph has a 10% chance of being killed. At 30mph pedestrians are killed 50% of the time. That extra 5 or 10mph that we all speed puts pedestrians in serious danger. We’d like to put the blame on distracted driving or drunks, but all of us speeders are at fault as well. 23 years out? Make the goal 2025!